The hope of nine Nigerian youths and a national of Niger Republic for greener pastures in Europe through vessels was dashed after they were arrested by the Nigeria Immigration Service . The suspects were said to have been assisted into the vessels by some fishermen who paddled them on local boats before getting them aboard the ships . The Comptroller , Nigeria Immigration Service , Lagos Seaports and Marine Command, Modupe Anyalechi , said five of the suspects were discovered on Sunday inside the rudder truck of MV MSC PAOLA by some immigration officers who rummaged the vessel at fairway buoy , around six nautical miles to finger jetty , Apapa Port. The other five , according to her , were caught on Monday on board of MV MAERSK CHANNIA by some naval officers, who handed them over to the NIS . She said the suspects were , however, unaware that most of the vessels only plied waterways of West African countries and the Gulf of Guinea . “ Our efforts have made it almost impossible for stowaways to access vessels from the quayside ; hence , they now resort to using canoes with the assistance of fishermen , to get into vessels through the propellers when the vessels are gradually sailing to the high sea along the channel . This was confirmed in the confession of the stowaways . “ Their reason for this act , as they claimed , was in search of greener pastures in Europe and the western world . Unknown to them, however, is the fact that some of these vessels are Coastal , whose activities are limited to West Africa and the Gulf of Guinea , ” she said . 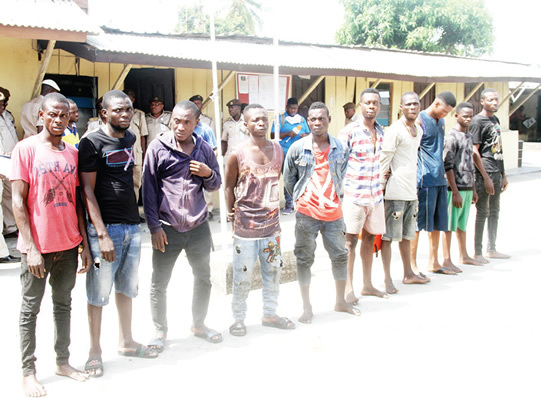 Anyalechi identified the suspects as Orire Popoola, Kelvin Wessey , Erukudami Moses, Odiyeye Abiye , Agba Victor , Odogwu Michael, Kelly Onikan , Pope Ekele , Asumah Ukpere and Wessem Nasuru . Twenty- eight – year – old Popoola said all the stowaways got on the vessels on their own , adding that they only met after they were arrested. The Ondo State indigene said they all thought the vessels were Europe- bound. He said he was ready to take any risk to leave the country . “ I will take any risk to find my way out of Nigeria . I have no job . I believe that if I can follow a ship to Europe , I can be anything I want to be. I thought the ship was going to Holland or any other part of Europe , ” he added . Wessey , 24, who claimed to be a Lagos State indigene , said he wanted to leave the country to play for a football club in Europe . He said , “I have been suffering for many years to be somebody in life , but no way. I am a footballer ; but I don’ t have any connection . I want to play for big clubs in Europe. I felt if taking this risk would make me achieve my dream , then so be it . I know I could have died while doing this . I did it on purpose . An artiste , Odogun , said he had been performing at different shows without making headway in life , adding that he thought the risk would change his life for the better . “ I do not hate my country and I am not trying to run away . I just needed a place where I can find help. My mother died last two months and my father is crippled . I am the first child of my father and my only brother is in the village , ” he added . Ukpere , 24, said he had been frustrated by joblessness , adding that his attempts at joining the NIS were futile due to lack of funds . He said , “ The life I am living in Nigeria is meaningless . I have looked for jobs in many companies in Lagos without getting any . Hey Buddy!, I found this information for you: "Will Take Any Risk To Leave Nigeria – Stowaway (Photo)". Here is the website link: https://360kwado.com/will-take-any-risk-to-leave-nigeria/. Thank you.